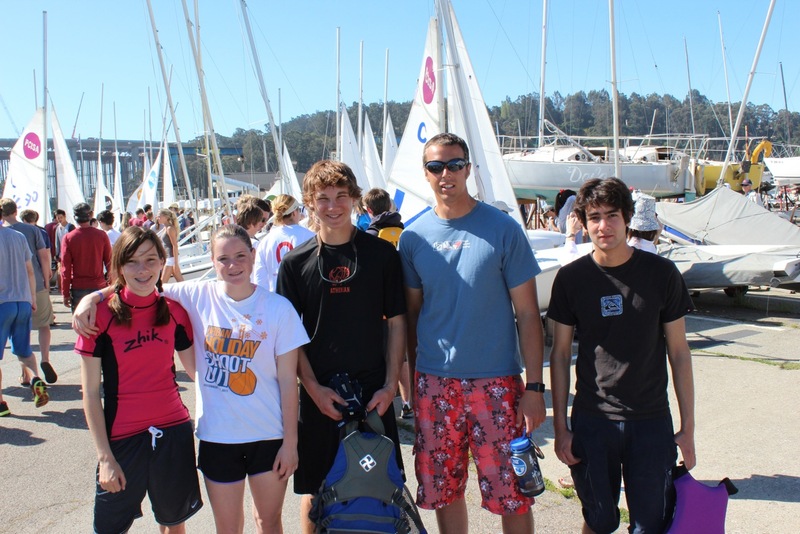 Athenian’s sailing team competed in the Pacific Coast Championships on Treasure Island this past weekend. Despite being without their team captain, this group (including one rookie who’d never sailed before!) held their own in an intense race. We had quite a regatta at Treasure Island this weekend, with 20 teams from California attending the Pacific Coast Championships. The PCC’s are the final regatta of the year and the top five teams advance to compete for the Mallory Cup in Seattle this May. For many sailors this was their last regatta, and some had spent an entire high school career trying to reach the High School National Championships. Athenian High School was invited to participate, and managed to field a team despite the fact that their team captain and “A” skipper Haley Kardek is currently studying abroad in India. Senior Parker Hamren stepped up to the plate to fill in for Haley. It was a tall order, considering he had never been in a race before. His crew Tyler Huntington had even less experience, with just 3 days of sailing under his belt… total. Having done some dinghy sailing in the past, Parker and I went through an INTENSIVE 3 day crash course on racing last week here at the club. He spent about 8 hours over three consecutive days with me learning basic rules, roll tacking, starting etc. I was nervous to say the least going into this weekend. It was a big deal for Athenian to be invited to such a prestigious event, and I wanted to have a good showing. We set goals of getting around the course without delaying races, not committing any egregious fouls, and staying safe. I told them it was highly unlikely they’d beat any other boats, since they were sailing against the best talent on the West Coast in the biggest regatta of the year. 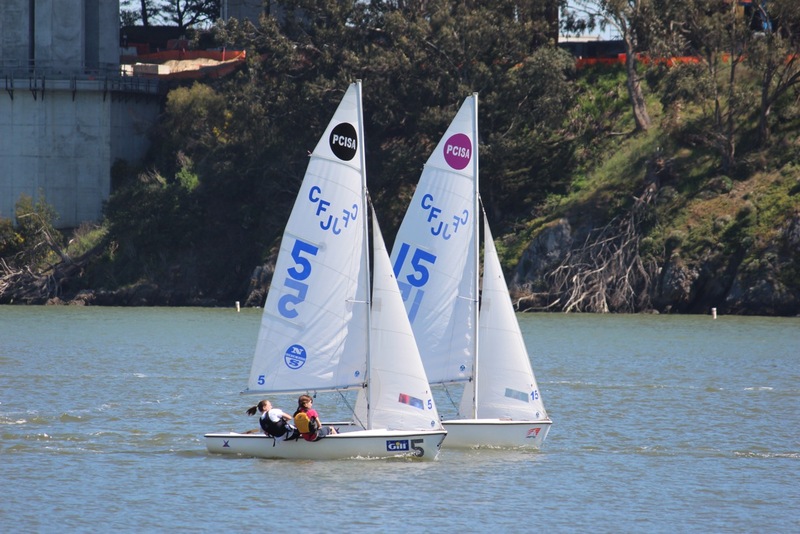 Abby Kardek and Gabby Rigby went out for their first ever Gold Fleet race in the light morning breeze. Gold Fleet is a lot tougher than silver fleet, as Abby and Gabby quickly realized. There is no room for error when sailing against some of the best in the county. Everyone sails fast and there are no stragglers to catch after a bad start. Simply put there is no margin for error and no playing catch up. I wasn’t too worried about the girls holding their own, and by the end of the day the girls had posted some mid-fleet finishes. Abby has plenty of experience sailing in tough fleets and their boat speed was comparable to that of the leaders on day one. I was pretty nervous as the boys got in the boat for their first “B” division race. It took the boys about 2 minutes to get off the line and up to speed. I couldn’t watch them crash and burn, so I went to go stand in line for lunch. When I came back they were being lapped, so I turned around and got seconds. I was seriously thinking about pulling the plug on their day, however in the second race they showed a bit of improvement. As the breeze built and the day went on they closed the gap between the boats in front of them. They were still finishing a minute or two behind, but each time they were learning from their mistakes. Once they got off the water they stood with me on the wharf and we watched the other races. Like sponges they were quickly soaking up valuable bits of sailing knowledge though observation and inquiry. Each race was better than the last, and soon I had a bet going that they’d beat a boat by the end of the regatta. They won the pin end of the line towards the end of the day on Saturday, and I was sure this was their race. Quickly the other boats caught up to them, but they proved to themselves they could hang with the pack even if it was for less than a minute. Sunday was a new day, with a fresh westerly wind of 12 knots in the morning which built to near 20 knots by late afternoon. Considering they were the lightest boat in their division, Abby and Gabby went out and did surprisingly well in the breezy conditions. The boys still looked exhausted from the 8 races they had sailed on Saturday, but they didn’t complain one bit and got right back in the saddle. After watching the first race I was sure that any progress we had made on Saturday was lost. I started looking for the taco truck, so I’d have an excuse to turn away from the action, but to no avail. Then on their second race of the day they were right back on the heels of the fleet. With the breeze building to over 15 knots I was just glad they made it around the course. At least we were still on track with our original goals. In between sets we talked about the importance of staying in a full hike and using the mainsheet to balance the boat while going up wind. Parker was also footing a lot, which made it hard to keep the boat flat. In A fleet the girls were getting severely over-powered. Their combined 200lbs was not enough to keep the boat manageable. They appeared to be sailing in survival instead of race mode, while the bigger pairs put their weight to work on the upwind legs. After a capsize it appeared the girls were done for the day. Both were cold and exhausted, and without any alternates we had no subs to put in. Watching boats capsize in A fleet must have been unnerving for the boys, but once again they went right back out. On the downwind leg they soon found themselves swimming. I was surprised how quickly they were back up and going considering we hadn’t had time to do a refresher talk on capsizing. Still they completed both races and were hanging tight. The wind continued to build, with gusts near 20 knots by 2pm. The boys, undaunted, headed out for their last set. They had the best start of any boat and went out left with pretty good speed. Their boat was moving and pointing like all the others. They were hiking hard and putting their weight to work. They beat 3 boats to the weather mark, but their lead was shrinking. They were passed by all three on the second beat, but they were still in the hunt as the fleet headed for the downwind finish. Five places in front of them a boat capsized, then a second boat went over a bit further down the course. If the boys could stay upright they’d beat at least one boat. With their bailer long since lost, they were in danger of submarining. They quickly overtook both capsized boats, but with gallons of water in the boat and only a couple inches of freeboard, they were dangerously unstable. They held on and crossed the finish line in 18th place, promptly death rolling five seconds later. By this time most of the sailors and spectators on the wharf knew their story. There were cheers from several people on other teams as they crossed the finish. I personally don’t think I’ve ever been as ecstatic about an 18th place finish. They went from being a joke, to being an underdog, to being heroes. It was quite an event to make one’s racing debut, but I was really blown away at how the boys handled everything. Attitude is everything and the boys reminded me of that this weekend. Make goals, set your mind to it, put in the effort and don’t back down. One of the other coaches, who never gives compliments, told me with complete sincerity how blown away he was by their progress, composure, and performance. This was definitely one of those regattas where the final score doesn’t reflect how you feel at its conclusion. Athenian finished dead last, but I’m still grinning like an idiot; proud of the way the WHOLE team sailed. Results should be posted soon on the PCISA website. Kudos to Branson High School for qualifying for nationals. It’s been a while since we’ve had a NorCal team in the running for the Mallory Cup, so wish them luck and cheer on your district.